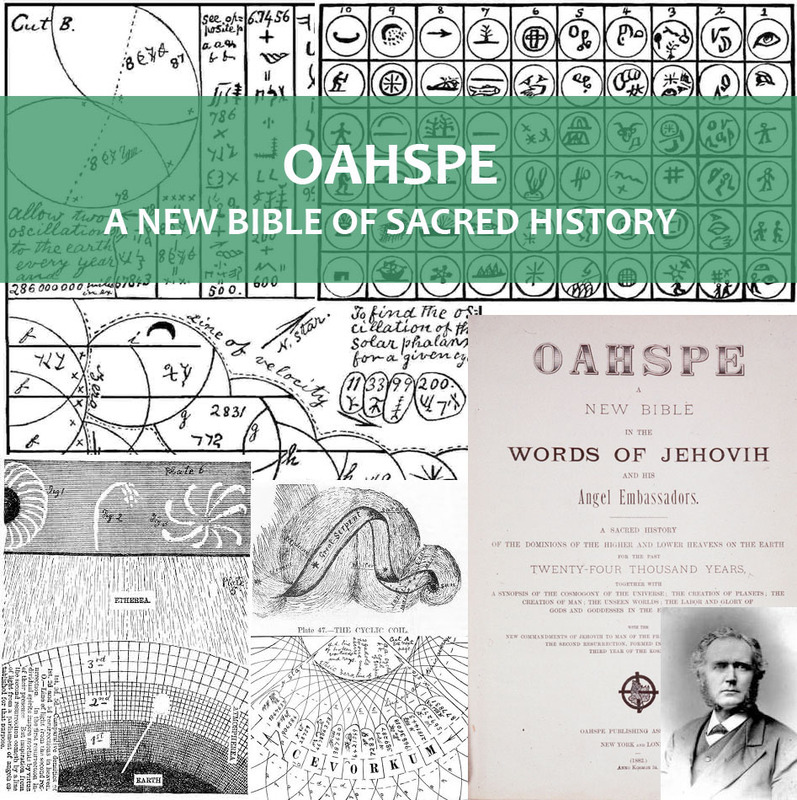 Its difficult to decide exactly what to say about Oahspe. Its a pretty amazing book. I’d have to say that when I first started reading it it often rubbed me the wrong way. Because of the challenging ideas it possesses, its hard to recommend to any orthodox religious believer, but it was precisely those complex challenging ideas which kept me reading it over and over. Parts of it might be down-right dangerous to a stable mind. Much of it comes across anti-organized religion; in a way reminiscent of early LDS authors and preachers. 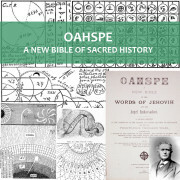 Oahspe was revealed through John Ballou Newbrough in 1882. As told in his own words, John dabbled in spiritualism for ten of fifteen years until he “was not satisfied with the communications; [but] was craving for the light of heaven”. In time he says “I took it into my head that wise and exalted angels would commune better with us if we purified ourselves physically and spiritually. Then I gave up eating flesh and fish, milk and butter, and took to rising before day, bathing twice a day, and occupying a small room alone, where I sat every morning half-an-hour before sunrise, recounting daily to my Creator my shortcomings in governing myself in thought and deed”. After six years of governing himself thus, he states to have begun to be visited by angels who “propounded to me questions relative to heaven and earth, which no mortal could answer very intelligently”. Two years subsequent to his communion with these angels, he was directed to buy a type-writer; whereafter he was instructed to rise early and with an angel standing over his head directed to write for a half-hour or so each morning for fifty-two weeks by the process of automatic writing. He was also directed not to read what was written until it was all finished. Upon completion he was instructed to publish the book without forming a church around it. During this period John “pursued his vocation” of Dentistry, until 1884 when apparently in seeking to follow the teachings of the book, he moved to an area near Las Cruces, New Mexico and started a commune-type colony called “The land of Shalam”. In 1885 Newbrough and his wife eventually gathered fifty children and followers from foundling homes, police sergeants, and depositories”. By all accounts, the children, from all races, were pampered and treated with love and kindness, however, due mostly to financial failures the the colony folded by 1901, and the children were sent to orphanages. If I had to pass judgement, I am still not sure where to classify Oahspe’s “heavenly origins”. 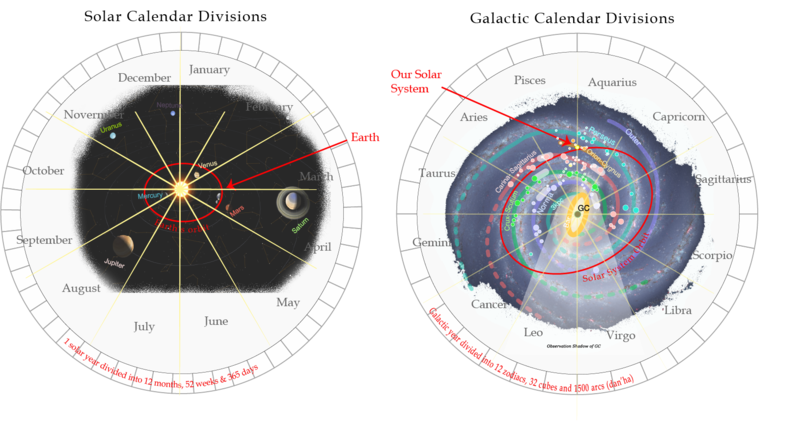 The channeled material in the popular “Ra” book suggest that some unknown organization from the terrestrial or celestial levels of heaven approached some of the beings who govern our solar system, and suggested to aid man’s progression through revealing this book which spreads truth and error by its presentation of historical accounts of previous cycles of the earth’s existence. To me, there are a few problems with this possibility, but notwithstanding my opinion, the similarities to Mormonism in the book are not easily dismissed. It contains so much information about the “laws of the higher kingdoms” concerning ascending to the higher heavens (Terrestrial & Celestial Kingdoms in Mormonism) as to be uncanny. Also about building Zion, the united/communal order, and the condemnation originating from material inequality. How earthly religions turn into idols and must be renewed/torn down. The cycles/dispensations/times of the gospel and its messengers. How unselfishness in the key to exaltation. Detailed cosmology and physics principles, Etc, etc.. But at the same time the text typically condemns the earth’s religions and paints them in a negative light, instead of showing them as imperfect “schoolmasters” as Paul seemed to view Judaism. The scribe(s) is/are generally anti-religion but pro-spirituality and somewhat misrepresent or distort the role of religion in earth’s history from my perspective. It derides the four beasts/false Gods/religions of the Millennium (Hinduism, Buddhism, Gentile Christianity & Islam), but completely ignores the true/false dualism in all these religions and presents them in an attitude of criticism so as to try and destroy faith altogether instead of leading people to any kind of unity of faith or universalism. Its account of “Joshua” (Christ) would lead one to believe that the historical Jesus was indeed a high follower of “Jehovah” who did many miracles, but that the biblical account of Jesus was largely manufactured by the early Christian Church. An LDS reader would probably want to skip this section of the text altogether. I’ve come to my own conclusions about which parts might be true and which parts are distorted, but the reader will have to judge for themselves. I believe that even with the Spirit of discernment, many readers will get a little screwed up in their attempts to make sense of the historical aspects of this book. (The spiritual aspects are pretty spot on for most Mormon readers). As is typical of restorationist text supposedly originating from or passing through the lower heavens, my opinion is that the work is the least accurate in its accounts of more recent Western World events (founding of Christianity, Islam, America, etc), almost as if it came through a more Eastern World religious tradition (perhaps even a Chinese tradition). The book does however, present interesting similarities concerning the Book of Mormon “Jaredite” people (Algonquin) and the principles of exaltation (it’s group nature), as well as various peoples temple rights and histories. Open an HTML version of Oahspe here.